Lopolights are a combination of an innovative use of LED's and very sophisticated electronics that delivers low power consumption and extremely long lifetime even in the harshest conditions. 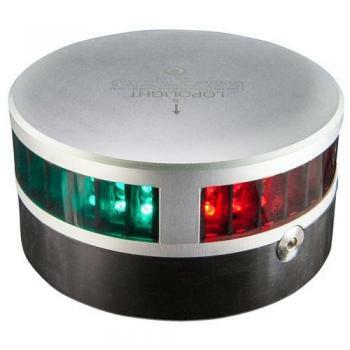 All Lopolight LED Navigation Lights lights are completely sealed to allow them to operate while fully submerged. The lens resides within a waterproof anodized aluminum housing that is CNC milled to exact dimensions. The whole light is then filled with epoxy, leaving absolutely no air inside the unit. This construction process also ensures that a Lopolights is absolutely vibration proof, there are no moving parts and the LED's are fully vibration proofed. LED (Light Emitting Diode) navigation light.Unique and precise definition of light angles.Rugged and..
Tri-color with anchor light and strobe for sailing yachts between 12 and 20 meters (39.4 - 65.6 feet..